Rock salt-sprayed sayings with this custom ribbed tank top. The throwback ribbed tank makes a comeback, topped with eyelet trim and a typography graphic printed at the center front. 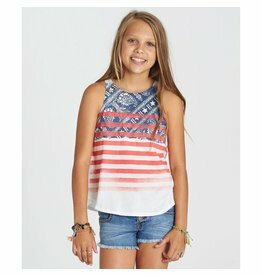 Rock red, white and deep water blues in the patriotic Paisley Flag tank top. The bandana print and red stripes graphic is printed at the front of the modern swing tank, featuring an A-line cut, high neckline, rounded hem and relaxed fit. Settle into the summer groove with a bohemian or paisley print flutter top. The modern take on the peasant blouse features an allover print, elastic neckline with ruffle detail, and updated knit construction. A top with a spirit as light as a feather. Toss on this high-low hem tank top for a dose of creative print with beachy undertones. It’s the perfect spring refresh for your wardrobe.